Who is sitting in the other nests? Which of these things belongs up in the air? Draw them in the sky above the city. Draw a bridge that lets the little monster get to his house. Draw a colourful garden for the city dwellers. Which animals have snuck into the bird party? Colour them in. Do you know the alphabet? Letters are used for reading and writing, but you can draw them too, in many colours and shapes. Finish colouring the alphabet on the left side. Do you know which letter starts your name? Draw a big version of it on this page. Some letters can easily be turned into animals or monsters, with claws or wings. Maybe they’re even wearing shoes? What other creatures can you turn these letters into? Can you transform more letters into things like trees and houses? Finish drawing the letter city. Who is playing jump rope? The little monster is cold. Draw things that will keep her warm. 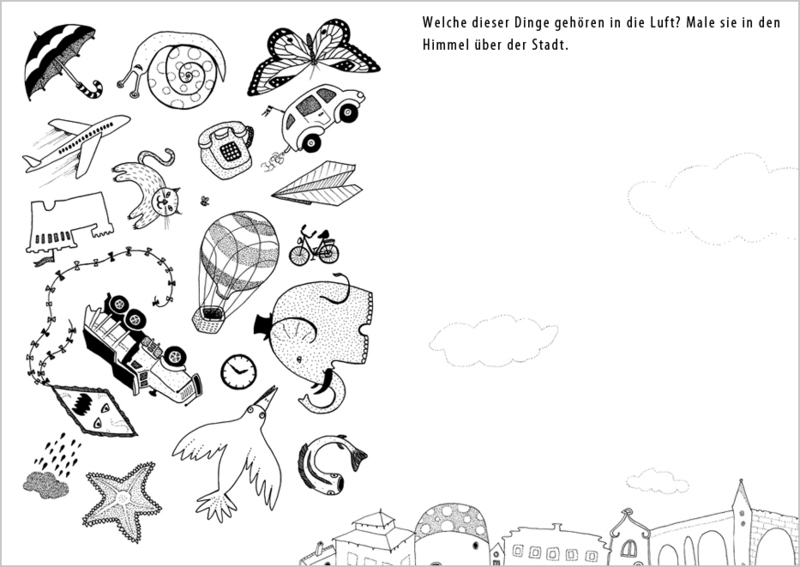 Excerpts from the Krickel-Krakel/Doodle series for children, created by the Krickelkrakels, published by Oetinger.